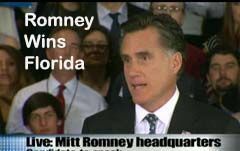 The Florida Republican primary has been called by the news outlets for Mitt Romney. Mitt's speaking now. He says they will win in November. He says it's time for President Obama to get out of the way. He's ready to lead the party and the nation. He will begin a new era of prosperity. He will save the soul of America. He will balance the budget without raising taxes. He will repeal Obamacare. He will strengthen religious rights. "I will insist on a military so powerful no one would ever think of challenging it."